Kathryn Beisner tailors the content of all presentations to each audience, complementing the goals of your event and providing a memorable and valuable experience for your attendees. Speaker selection is strategic business. Choose Kathryn Beisner when you want to create an energy throughout your audience that celebrates the essence of your entire event, or focuses on a specific breakout topic. She will motivate, educate, inspire, and provoke thought in your attendees, offering them gems for their professional and personal endeavors. CAUTION: People will enjoy this experience! captivated all the way through! Self-esteem is a journey taken every day that leads to personal and team success. This lively presentation will explore the dynamics of self-esteem, its impact on peak performance, and valuable steps to enhance self-respect. Camaraderie will soar throughout the room as quirky observations of life are brought to light and we realize, again, that we all are more alike than we are different! When they celebrate the year 2100, who will be remembered as the most influential women of the 21st century...will you be among them? Ms. Beisner discusses the visibility of women. Dreams are made of risks and adventures. Attendees will be invigorated to take those leaps, and learn to finance their transitions with the tried-and-true envelope system. An inspirational presentation that will impel audience members to recall the stories that have changed their lives. Recommended 1.5 - 2 hour time slot, pending size of group. As a workshop facilitator Kathryn Beisner wants her group to have fun with the subject and with each other while acquiring valuable tools to enhance their capabilities. Thus, each of her workshops are creative, participatory, and supportive of each of the attendees. I would attend another workshop with Kathryn. got the whole group to participate. Stop The Madness! You Already Have What You Need To Succeed. Most of us are living our dream and don't even recognize it. This daring presentation focuses on how to live authentically every day and realize the power of your true self. Ms. Beisner discusses three "doable" steps to living your dream and provides anecdotal examples of others who have! Ms. Beisner uses lively workshop exercises and story excerpts from her work to demonstrate how to use the elements of a good story to shape successful interactions at work and home. Highlights include using real vs. perceived power to identify your audience, capturing your listener's attention, and how to be a savvy listener. Great for any professional, group, or individual building their public speaking or one-on-one communications skills. A unique workshop that teams motivational facilitator Kathryn Beisner with Iyengar Yoga instructor Cyn Hales to provide skill-builders for the mind and body. This program alternates musing yoga sessions with dynamic professional development workshops that meet your retreat goals, and can be easily practiced in the workplace to revitalize productivity. Select from Team Building, Communication, Problem Solving, Focus, Stress-Reduction, Balance, and Embracing Change to create your customized program. "A relaxed person possesses dynamic energy that does not dissipate." - B.K.S. Iyengar, Founder Iyengar Yoga Institute. This storytelling workshop includes how to choose, write, and perform a story. Participants will discover how the story you tell awakens a story in each of your listeners. Attendees will write, critique, listen to and support each other's efforts. Valuable for experienced or "wannabe" storytellers, corporate team building, and motivational events. Whether a corporate, social, educational, or private event is on your calendar, Kathryn Beisner will entertain and inspire your attendees with her spoken word artistry. She will choose a selection of stories that complement your event theme or programming goals and frequently will surprise the audience with a dialect from around the world! Each of Ms. Beisner's tales are originally written or originally adapted and reflect her contagious, entertaining perspective on life. Many thanks for a first-class presentation! Content ranges from fanciful to seasonal and real-life accounts. Stories that celebrate the accomplishments and adventures of women past and present. A novel tribute to an individual or group that becomes a living legacy. Ms. Beisner's areas of personal, special interest are adventure, humor, and women in history. The programs in this category are considered the speaker's choice: Ms. Beisner prepares a presentation on a particular adventure that she has had, shares an outstanding piece of research or a behind-the-scenes experience. overall it was just excellent! The Grand Canyon: "The Greatest Landscape on Earth"
Did you ever wonder what motivates a motivator? 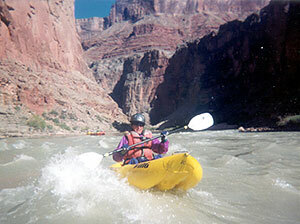 In 1988 Kathryn Beisner took her first trip down the Colorado River, as it roared through Grand Canyon. Beisner exclaims, "It changed my life!" In 2000, Beisner camped 300 million years ago with the Grand Canyon Field Institute on an eight-day raft through upper Grand Canyon; and then again in 2003 for another 18 days and a full 226 miles. Each expedition studied the history and folklore of the Canyon with geological and naturalist experts, and a bounty of adventures. Whether a corporate conference, fundraiser, or club luncheon is on your calendar, this program will enthrall the audience with a powerful sense of all that is possible! Contact KBS Productions to book an engagement with Kathryn for a motivational presentation, featuring stories, inspiration and what can be learned from one of the grandest landscapes on earth. It just may change your life! If voice-over talent is critical to the success of your project, Kathryn Beisner is available to give a voice to your instructional and promotional videos, voice mail greetings, and state of the art multimedia presentations. Choose from several dialects; Ms. Beisner will provide you with a clear, trained voice that invites and holds your listener's attention. Her professional style will allow you to keep your voice budget in line. Call for a voice demo tape, references, and fees.